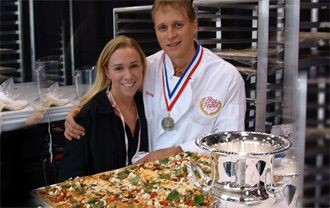 The newest location of Crazy Dough’s Pizza remains true to owners Doug and Melissa Ferriman’s commitment to serving fresh, gourmet pizza worthy of winning the Number 1 Pizza in America award - twice. Only two people have ever achieved this coveted recognition more than once and Boston is lucky enough to be home to half that elite list. With five locations in and around Boston, the first of which opened in Harvard Square in 1999, Crazy Dough’s Pizza is on a path of steady growth. Venture into their newest location, directly off the Green line Boston College stop on Commonwealth Avenue, and it’s easy to see and taste why one spot just wasn’t enough. Accustomed to hungry crowds, the establishment is quick to deliver an experience far beyond that of an average take-out food restaurant. The Potato Bacon Cheddar Pizza ($3.65 per slice) is the most popular among the many impressive options on the menu and it’s apparent from the first bite that the ingredients are of the highest quality. Topped with thinly sliced red bliss potatoes, 100% all natural mozzarella, smoked bacon, scallions and cheddar cheese, the pie is pure comfort food. Also featuring a surprising yet pleasing medley of flavors is the Nutty Tuscan ($3.90 per slice). The roasted plum tomato, garlic, pine nuts, caramelized onion, crumbled gorgonzola as well as fresh basil and pesto melt together flawlessly. Pizza is not the only award-worthy item on the menu. The venue’s Signature Salad ($6.75) sets itself apart with dried cranberry, caramelized walnuts, sundried tomato and rich crumbled goat cheese nestled in a crunchy organic spring mix. 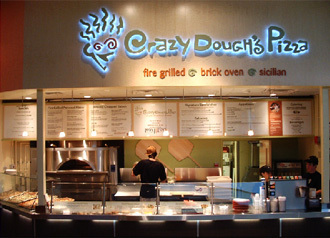 Also prepared with pride are the more traditional salads such as Cobb ($7.50), Caesar ($6.50), and Greek ($6.75) but of course Crazy Dough’s has a unique spin even on these dishes. Ask for it to be served in a one-of-a-kind Crazy Dough Bowl and simply fold the bowl into a sandwich halfway through your meal. 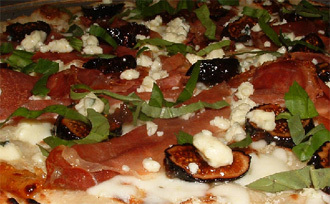 As their menu rightfully boasts, Crazy Dough’s Pizza is the only place in America to offer three distinct styles of delicious pizza; Fire Grilled, Classic Brick Oven and Traditional Sicilian. Doug and Melissa Ferriman have taken great care in creating consistency within each of their kitchens so that their prized food can be equally enjoyed at any of their locations with Boston College being no exception. Whether taking a meal to go, calling for delivery or delighting in the quaint outdoor seating among the neighborhood college students, rest assured that the Boston College location of Crazy Dough’s Pizza lives up to the hype.